Simple & Easy to Play! Ultra-Premium Long Lasting Bubble Solution! 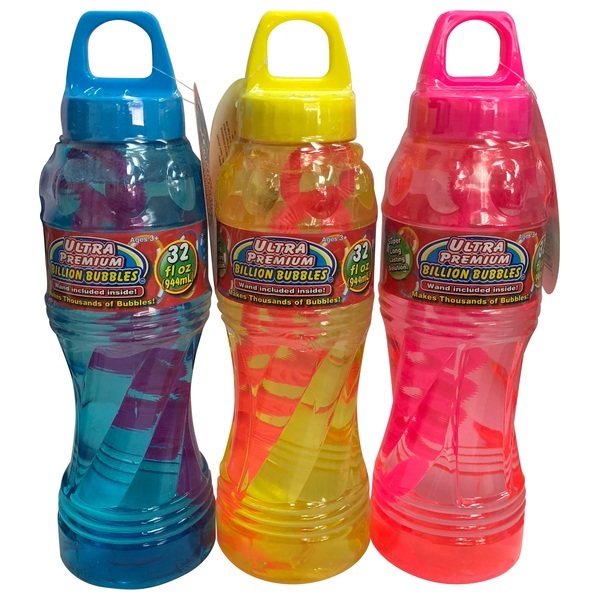 Refill for other Bubble Toys! The Ultra-Premium Billion Bubbles Solution contains 944ml of bubble solution, perfect for creating lots and lots of bubbles. The perfect toy to play with outside! WARNING: Do not drink the bubble solution. If swallowed, immediately drink plenty of water to dilute the solution. If the solution enters the eye, immediately rinse with lukewarm water. If any irritation occurs, seek medical advice immediately. EU Warning: Not suitable for children under the age of 3 years due to small parts which could cause a choking hazard. Recommended for outdoor use only. Use only under competent adult supervision. Do not blow in face, eyes or hair.